Since today Blocks is available for download on the Oculus Rift Store and on Steam for the HTC Vive. The VR-Creative Tool allows you to generate 3D Geometry in a Low-Poly art style without pre existing knowledge of complex 3D Modeling Software. I tested Blocks for you and talked to the Team behind Blocks. Google has already demonstrated with Tilt Brush that creative software is deeply rooted into the virtual reality ecosystem. Blocks is Google’s most recent contribution in the endeavour to fuse design and productivity inside VR. Blocks is 3D-Modeling Software that has been distilled to the absolute minimum required to create amazing models. Contrary to the comparatively complex to navigate sculpting tool Oculus Medium, Blocks´s experience is focused on minimal Interface and a shallow learning curve for everyone. Equipped with virtual pliers you manipulate points, planes and edges. You can either place geometric primitives in a minecraft style fashion or go one step further and model artwork akin to the 90s era of video games. Googles´s Blocks also received a similar community website that we know from Tilt Brush. Here you can browse through creations from the community without the need of a VR Headset. Everytime you hit like on a creation it is downloaded and available for you to view and remix locally on your system. Low Poly is resource-saving and timeless. Generating these kind of assets is pretty easy in traditional 3D modeling software but a bit time consuming compared to Blocks. Every file is saved as an .obj which is easily imported into 3D Software and Tilt Brush for post processing. vrhuman: Congratulations on the launch of Blocks! Tell us a bit about the history of development. Blocks Team: 3D objects are the building blocks of AR and VR experiences. But making them is hard! After building VR experiences of our own, we thought we could find a more intuitive way to create those building blocks – and that making them in VR could be the answer. 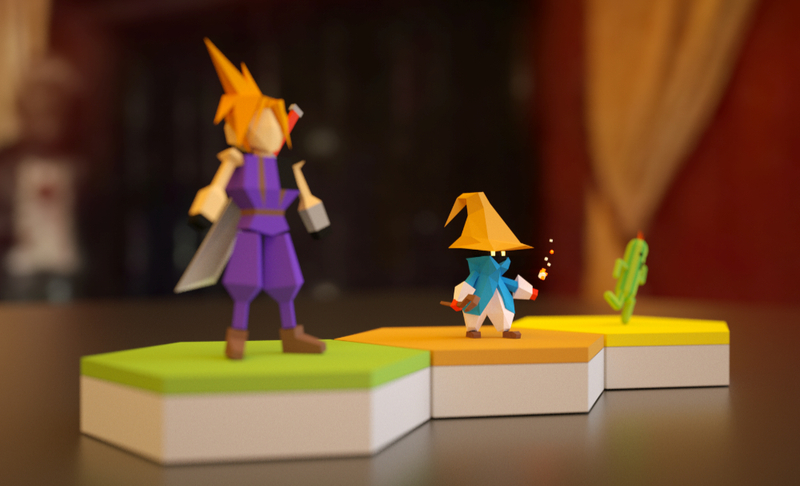 We built Blocks to make it easy for anyone to make beautiful 3D objects, regardless of their prior modeling experience. vrhuman: With VR Apps like Tilt Brush and Blocks we now have two exciting creation tools from Google. Please share your thoughts on creative/productive software in VR with us. Blocks Team:Today, building VR and AR experiences mostly relies on creating on 2D screens. But our brains are not wired to think that way. The benefit of creating in VR is that the creator can model or create in 3D space. If you’re concerned about proportions or symmetry, simply walk around your creation to check. We are excited to add Blocks to our suite of creative tools and continue to make creativity in VR flourish. vrhuman: Solving 3D Modeling in VR is a huge task. What did you focus on? 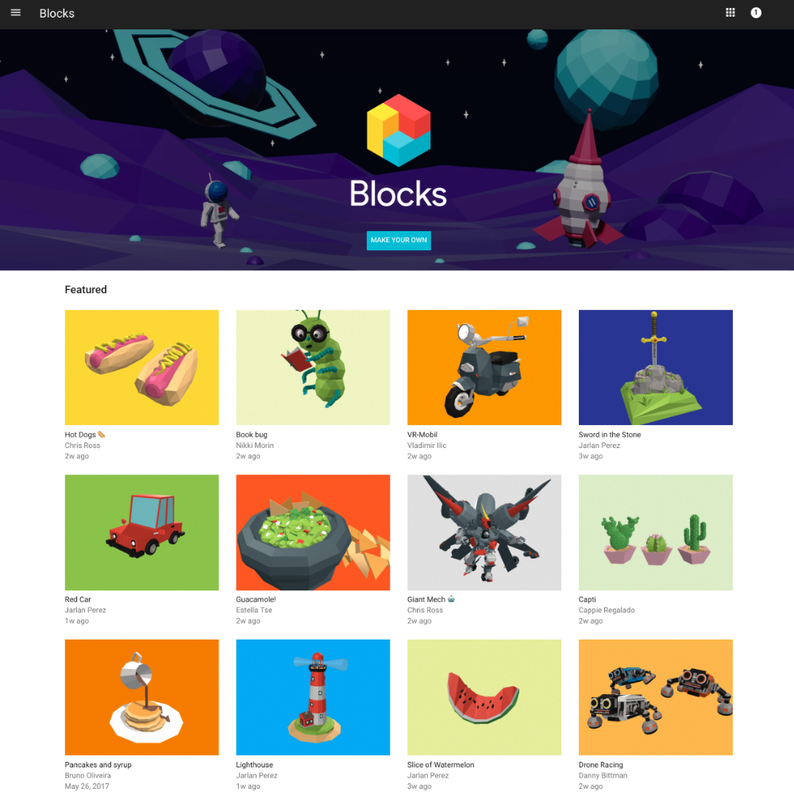 Blocks Team: We wanted Blocks to be easy enough for anyone to create beautiful 3D models, so we focused on simplicity and speed. This meant creating intuitive tools that could empower a creator to make anything from a simple sphere to a complex robot, without spending a ton of time. The low poly aesthetic is also critical; this ensures all Blocks models have a consistent style, making it easy to create a VR or AR experience with Blocks models alone (not to mention the performance benefits!). vrhuman: What are you looking forward to see the community do with Blocks? Blocks Team: We’ve already seen the community and early testers make amazing things with Blocks! In our gallery you’ll see lots of examples, and we are looking forward to seeing more artists, creators, and anyone who enjoys VR continue to contribute. We also hope our remixing feature will inspire the community to create together, whether collaborating on a game or simply remixing each other for fun. vrhuman: What can we expect from Blocks in the future? Blocks Team: We are looking forward to seeing what users create! As is the case with any product we develop, we will be paying close attention to feedback as we evaluate future developments. Is there a way to script in Blocks? currently not. But if you are looking for a VR Sculpting tool for creating game assets you will be very happy with Blocks!